What is LGH File Inspector? 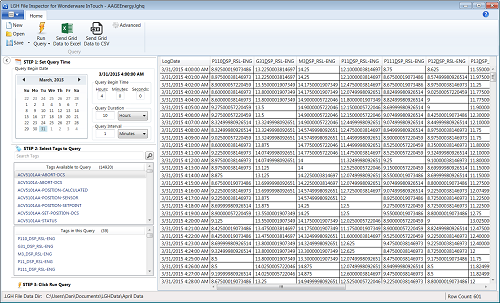 LGH File Inspector is a handy application for reading Wonderware InTouch LGH files. If you have a Wonderware InTouch SCADA/HMI application that logs data using the native LGH file format or you need access to these files, then this app is for you. LGH File Inspector provides an easy and intuitive user interface for querying and reporting historical data tucked away in those daily LGH files. In addition, you have three different places to view and analyze the query results: send data to the screen in a handy data grid, to a new or existing csv file, or to a new or existing Excel workbook. In addition, LGH File Inspector queries can be configured to execute automatically at regularly scheduled intervals. Automatically create new or update existing data in Excel workbooks and csv files based on user action or a regularly scheduled interval. Choose to create new csv files or append to existing csv files. You can even customize the filenames to include the query beginning time as part of the name. Use the Advanced Query Settings to configure the query to initialize and output to a new or existing csv file or Excel workbook. Install the software. The application installs in just minutes. You’ll be up and running in no time. Point it to your LGH file folder. Simply browse to the folder containing your LGH files. Define your query settings. 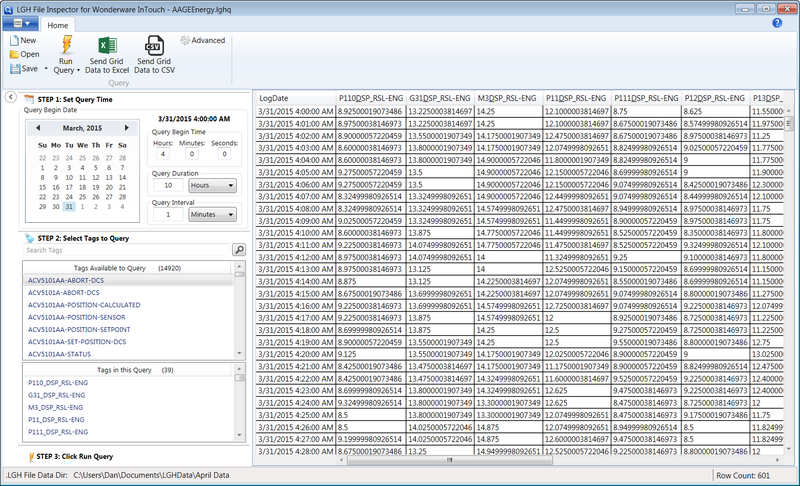 Specify your tags, the starting time, duration and frequency of data to be returned. Specify your query output. Send the query output to screen, csv file, or an Excel workbook..
Read our news article Wonderware InTouch Reports without Historian to learn how easy reporting can be using LGH File Inspector.